For those of us old enough to have lived through the Watergate era this is a huge loss. Daniel Schorr died today at age 93. Besides working at CBS during the Watergate era, Schorr worked at CNN in its early days and most recently has been a commentator for NPR. In White House recordings from 1971, Nixon and Chief of Staff Bob Haldeman discuss a tax investigation of Schorr in the Oval Office. “You take a fellow like this Dan Schorr, he’s — I notice — he is always creating something, isn’t he?” Nixon said. “Oh … He incidentally is on — you don’t, shouldn’t get involved in this, but he’s on our tax list, too,” Haldeman said. Schorr received three Emmy Awards for his coverage of Watergate in 1972, 1973, and 1974. He also won a Peabody in 1992 for “a lifetime of uncompromising reporting of the highest integrity” and was inducted into the Hall of Fame of the Society of Professional Journalists in 1991. 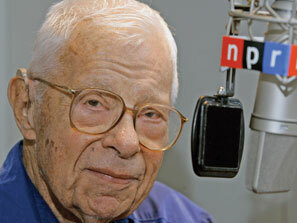 NPR has posted this tribute to Daniel Schorr. Posted in News Media, Richard Nixon. Tags: Richard Nixon. RSS feed for comments on this post.. TrackBack URL.